PLUG & PLAY 200 WATT AUTOTUNER 1.8 - 30 MHz WITH YAESU CABLE. Plug & Play Auto Tuner. You wont even know its there. The MFJ-939Y automatically tunes your antenna as you tune your radio. SWR is just always low. Tunes your coax fed or random wire antennas 1.8-30 MHz from 2 Watts QRP to full 200 Watts SSB/CW. Matches 6-1600 Ohms (SWR up to 32:1) -- thats a 50% wider matching range than competing products that are less capable and higher priced. And its made in the USA. As youre ragchewing, contesting or DXing, the MFJ-939 is learning your antenna and the way you operate and storing all this in its 20,000 memories. The more you use it, the more it learns. Measure & Compute = Instant Match MFJ-939 uniquely measures your antennas complex impedance (R, X), computes the L-network and snaps in needed components for instant matching. AdaptiveSearch determines a sub-set of all solutions that can provide a safe match and searches only that subset giving you an ultra fast match. Others search slowly through all solutions. InstantRecall first checks its memory to see if you have operated this frequency before. If so, tuning is instantaneous and youre ready to go! MFJ exclusive VirtualAntenna Memory system gives you 8 antenna memory banks of 2500 memories each. You can use an antenna switch to select up to 8 antennas and assign each antenna its own 2500 memories! 4 Times More Solutions and Faster! MFJ has 256 values each of capacitance and inductance for 131,072 matching solutions giving you a finely tuned very low SWR. That`s 4 times the 32,768 solutions of competitors using only 128 L/C values each! Don`t be fooled by competing products claiming fast search times -- if you have a quarter of the matching solutions, of course, it takes less time to finish but it's not faster. MFJ`s faster speed comes from advanced technology and software algorithms not from fewer solutions. An Audio SWR meter beeps when SWR <1.5, 2, 2.5, 3. Audible & Visible Diagnostic messages. Heavy-duty L-network: 10 Amp/1000V relays, RF duty silver mica caps wont burn up. Safe, reliable, continuous 200W SSB/CW. As Small as Your Radio. Tiny 6 1/2W x 2 7/8H x 8 3/8D. If you get a new transceiver, simply order a new Plug and Play cable for that tranceiver. 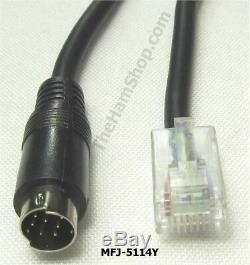 MFJ-5114Y - YAESU INTERFACE CABLE IS INCLUDED. 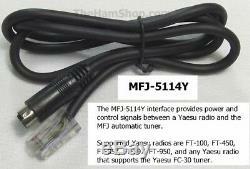 The MFJ-5114Y interface cable provides power and control signals between a Yaesu radio and the MFJ automatic tuner. Supported Yaesu radios are FT-100, FT-450, FT-857, FT-897, FT-950, and any Yaesu radio that supports the Yaesu FC-30 tuner. 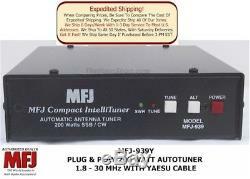 Note: This listing is for the MFJ-939Y for Yaesu radios and comes with the MFJ-5114Y cable. I don't sell used or refurbished equipment. The item "MFJ-939Y Plug & Play 200 Watt Autotuner 1.8-30 MHz With Yaesu Cable 20,000 Mem" is in sale since Wednesday, December 13, 2017. This item is in the category "Consumer Electronics\Radio Communication\Ham, Amateur Radio\Other Ham Radio Equipment". The seller is "thehamshop" and is located in Summitville, Tennessee. This item can be shipped to United States, Canada, United Kingdom, China, Mexico, Germany, Japan, Brazil, France, Australia, Denmark, Romania, Slovakia, Bulgaria, Czech republic, Finland, Hungary, Latvia, Lithuania, Malta, Estonia, Greece, Portugal, Cyprus, Slovenia, Sweden, South Korea, Indonesia, Taiwan, South africa, Thailand, Belgium, Hong Kong, Ireland, Netherlands, Poland, Spain, Italy, Austria, Bahamas, Israel, New Zealand, Philippines, Singapore, Switzerland, Norway, Saudi arabia, United arab emirates, Qatar, Kuwait, Bahrain, Croatia, Malaysia, Chile, Colombia, Costa rica, Panama, Trinidad and tobago, Guatemala, El salvador, Honduras, Jamaica, Antigua and barbuda, Aruba, Grenada, Saint lucia, Barbados, Bermuda, Bolivia, Ecuador, Egypt, French guiana, Gibraltar, Iceland, Cambodia, Sri lanka, Luxembourg, Oman, Peru, Paraguay, Reunion, Viet nam, Uruguay.